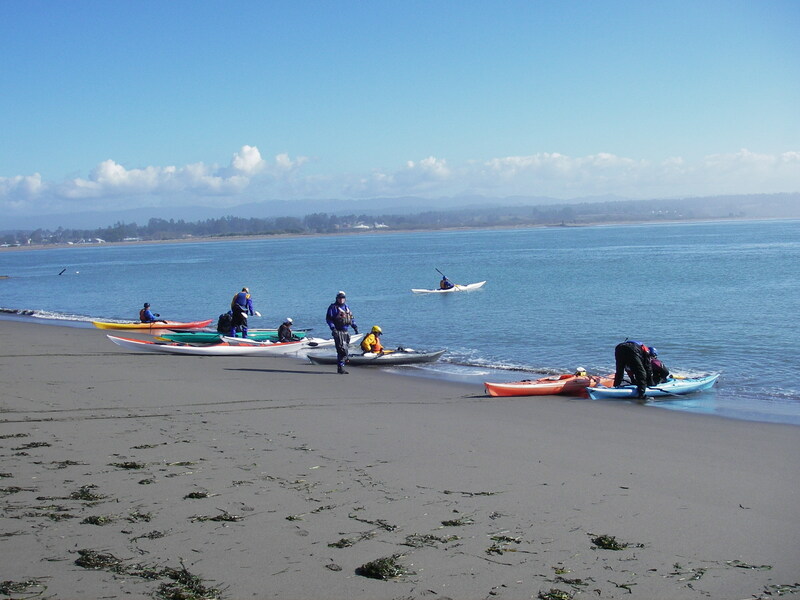 If you paddle east from Daby island on the Eureka waterfront and around the east side of Arcata Bay, you will come, after about an hour (at 3 knots), to Bracut. This “reclaimed” land at the edge of the Bay is mostly an industrial park and the former home of at least one construction supply store. 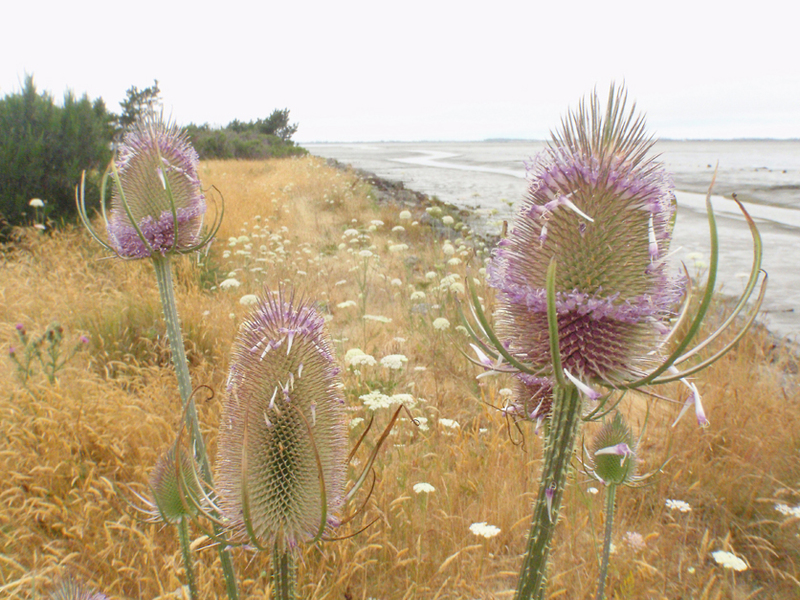 But, at the far end of this “island” between the freeway and the Bay, is 14 acres of reconstructed wetland called The Bracut Marsh Mitigation Bank. I’m always looking for a new place to camp on the bay, so I decided on the Bracut Marsh for this last weekend. 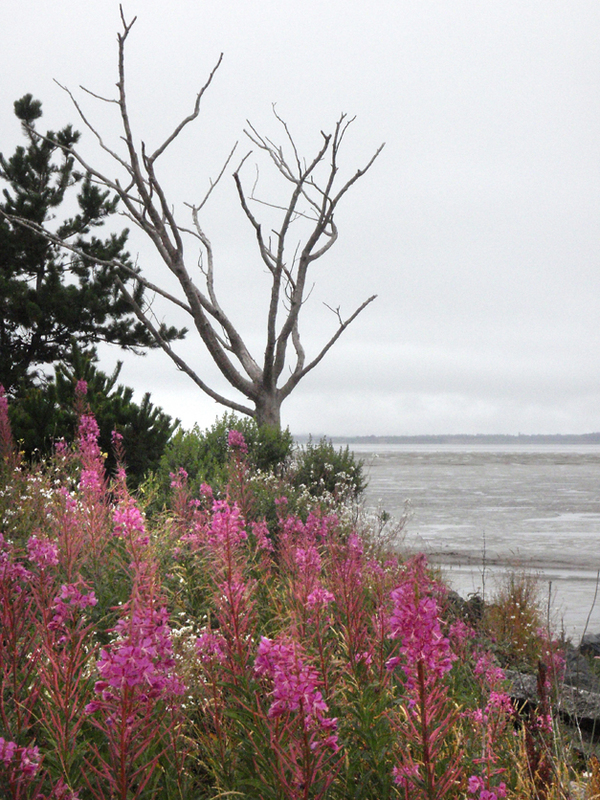 After an early-morning paddle (I launched at sunrise to make the tide) I found the Marsh loaded with blooming wildflowers. The many bird sounds were pleasant after the quiet of the open water. I went straight to the tent site I had spotted on a previous visit. After a cup of coffee I set up the tent and started to explore the area. 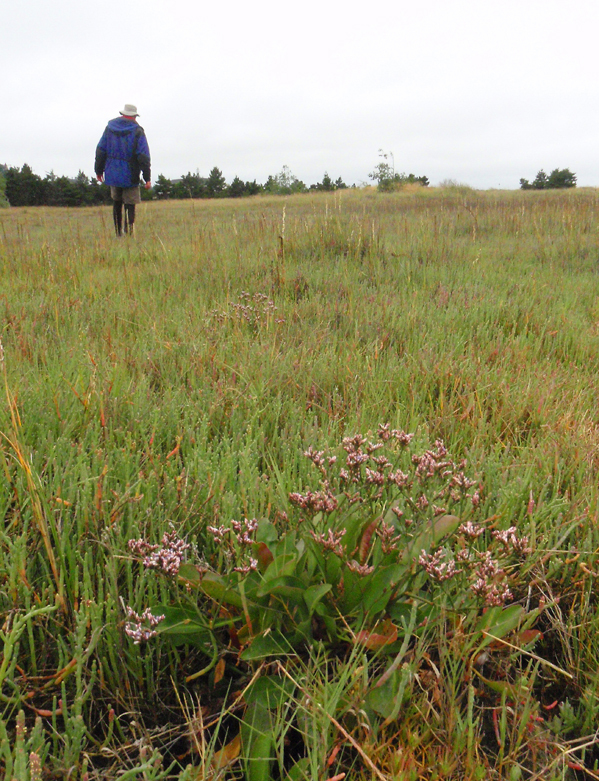 Inside the dike that surrounds the marsh is a tide-washed field of pickle grass with various other plants, some in bloom. On the far side are small islands with other grasses and small trees. On a sunny day, walking this would be great in bare feet- but it wasn’t sunny- I wore my Crocs. I checked out the woods too, but not far, because the trails were few. 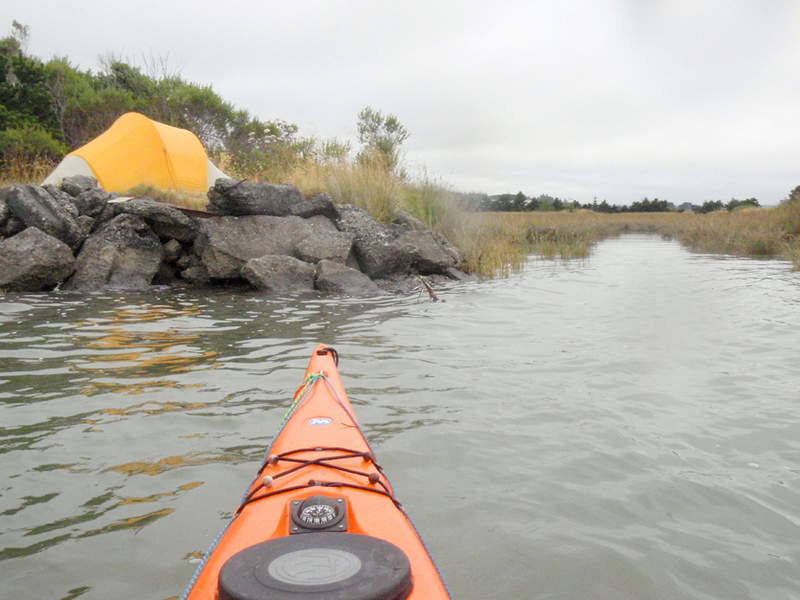 The day brightened in the afternoon with the sun poking out, and the tide was high again, so I paddled up to the mouth of Jacoby Creek about a half mile north of the Marsh and then just sat offshore in the small wind waves and enjoyed being on the water. Then back to camp. This camp out, I had the place to myself. Very peaceful. During my stay I saw two full tide cycles. The water moves surprisingly fast on the mudflats of the bay. The birds move with it, hunting for food on the water’s edge. The freeway is close by, but the sound of the traffic was not a bother. 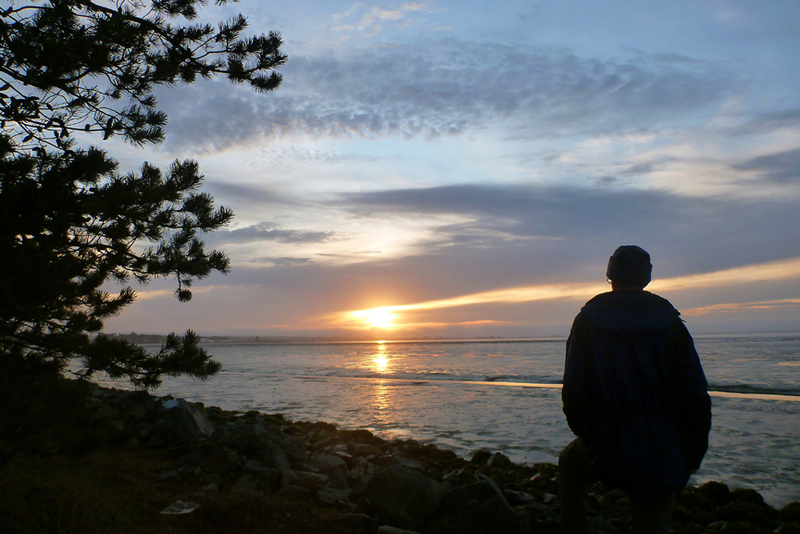 After a brief view of the sun going down under the clouds, my sleep was undisturbed. 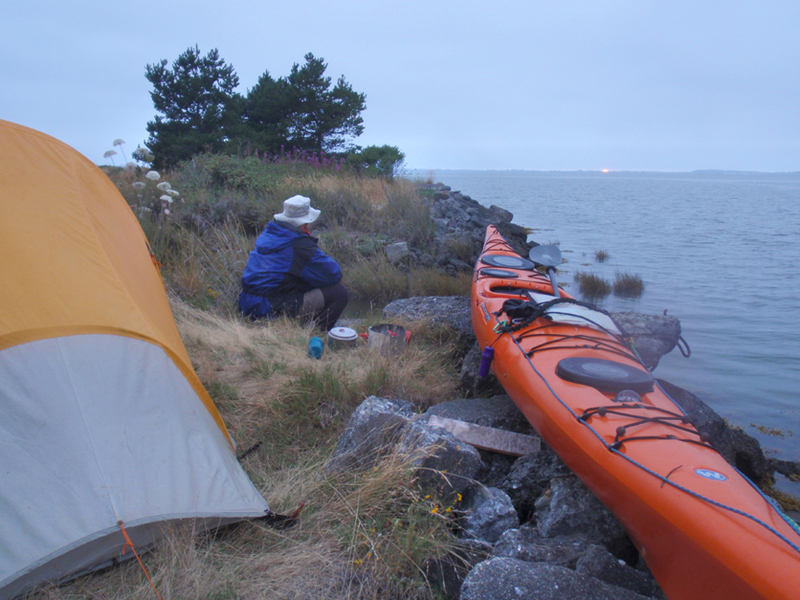 The next morning started before daylight again, and I paddled the high tide two miles out to Sand Island, where I watched clouds of cormorants circle and half a dozen salmon clear the water to escape the seals. Two more miles and I was back at the C Street dock and then back at home for coffee and a scone on the porch with Charlotte. 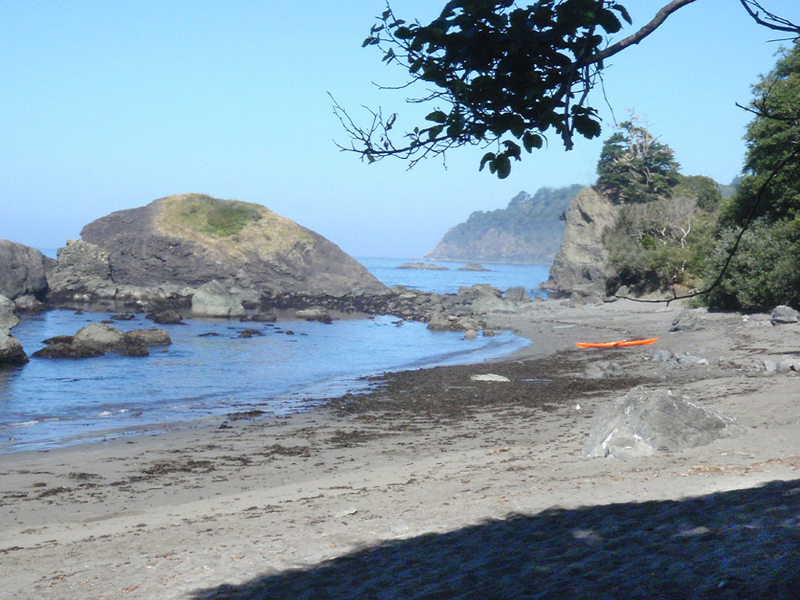 After a couple of weekends of great day paddles out of Trinidad Harbor, I decided to try a camp out on a secluded beach about a mile south of there. 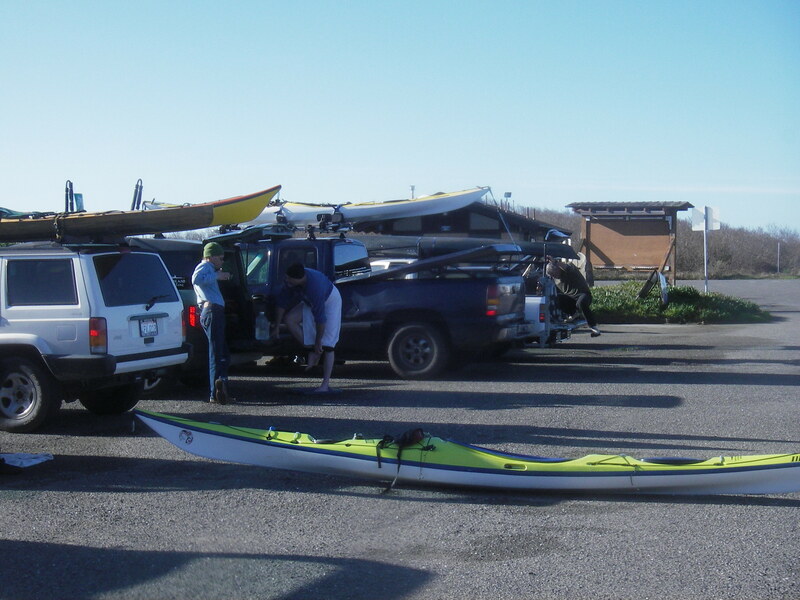 So, I talked Charlotte into dropping me off with my kayak and gear at Indian Beach last Saturday morning. 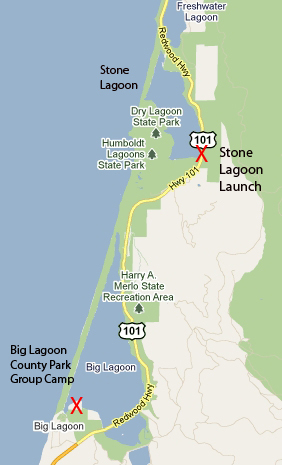 I stowed my camping equipment and she left to paddle at Big Lagoon. 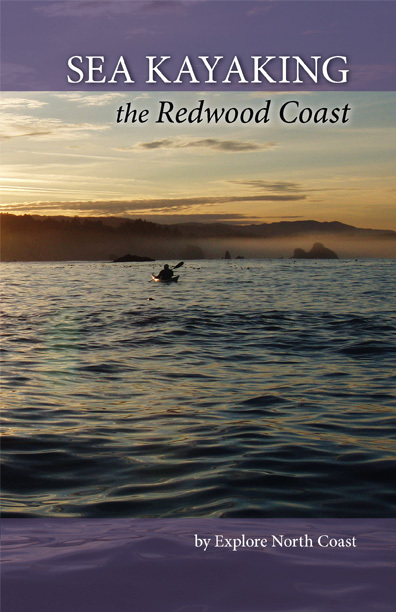 The day was sunny and windless, and the water was calm; the next day was supposed to bring even smaller swells. The paddle to my beach, which Charlotte and I had landed on in the past, took about an hour (I was not used to paddling there alone- I had always been with a group). 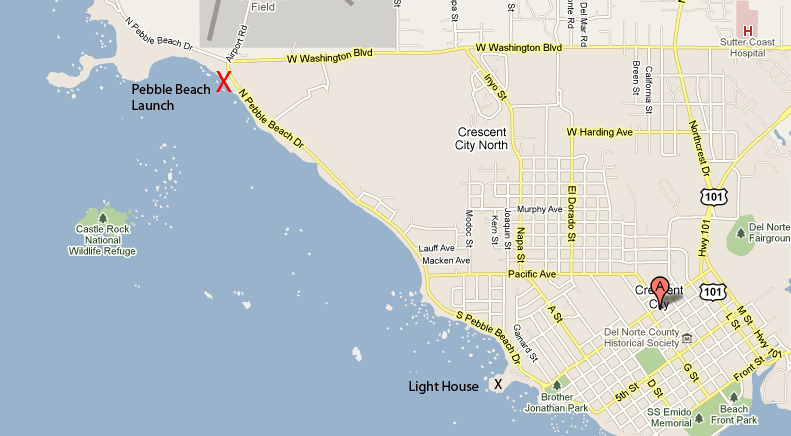 Standing offshore, I chose my tent site and then landed in a ripple at the north end of the beach. I fixed a cup of coffee and enjoyed being the only human in sight! The scene was wonderful! Blue sky, blue water, and an empty beach. I soaked it in. Charlotte checked on me about noon with her VHF radio from Trinidad just to be sure that I had landed okay, then headed home. A person showed up far away down the beach. 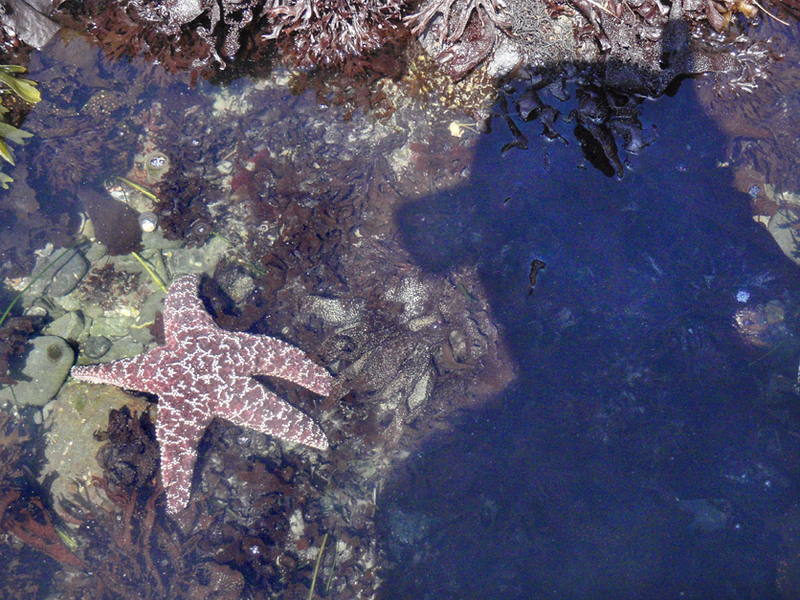 I took pictures and waded around in the clear water of the big tide pool in front of my camp site. Another walker passed my camp. I had lunch of cheese and trail mix. By one o’clock there were people from one end of the beach to the other- most were naked and soaking up the sun. A guy in only a T-shirt told me this was Baker Beach. 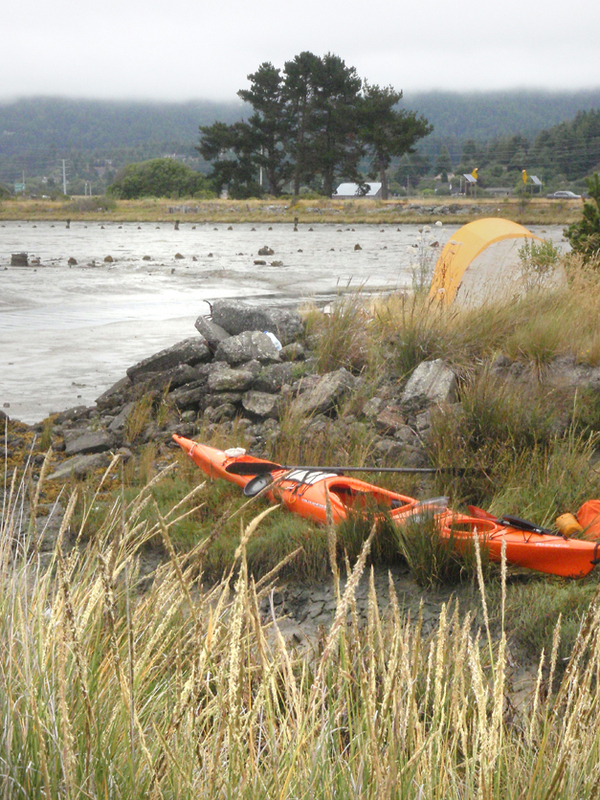 Exploring the area on foot wasn’t easy after that, so I paddled the cove in the kayak for a while, then beached and took a nap. 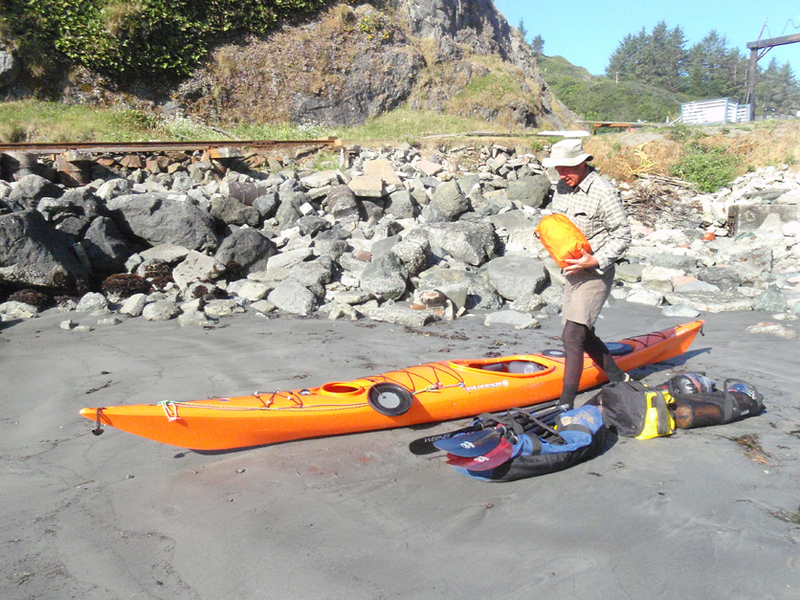 Then, I sunburned my ankles just sitting around on the sand, so I suited up again and took a paddle close to shore, at high tide, up to the “slot” and back. 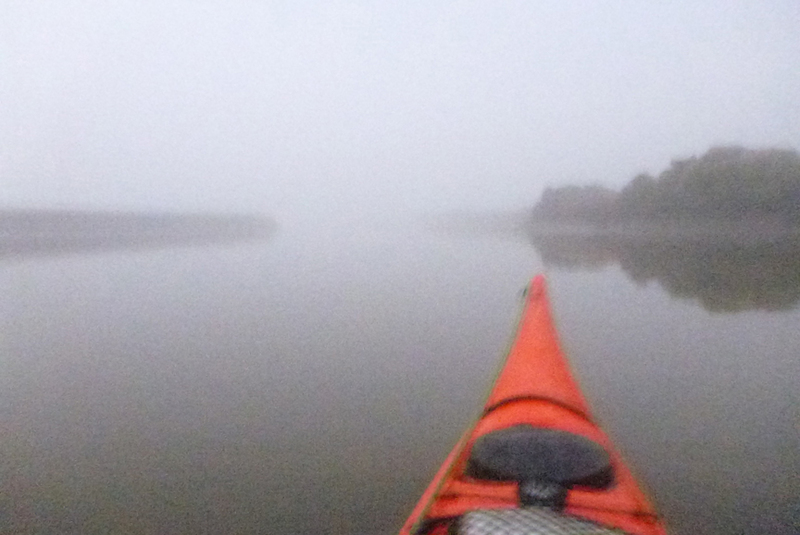 The fog had come in by then, but it was fun threading through the inshore rocks. After that, and a few more photos, it was time for dinner and bed as it got dark. Morning was a trip. After coffee and packing up the gear, Charlotte checked in on the VHF and I was on the water before I knew it to meet her just offshore in the now choppy water. We decided to go south to Little River Rock. 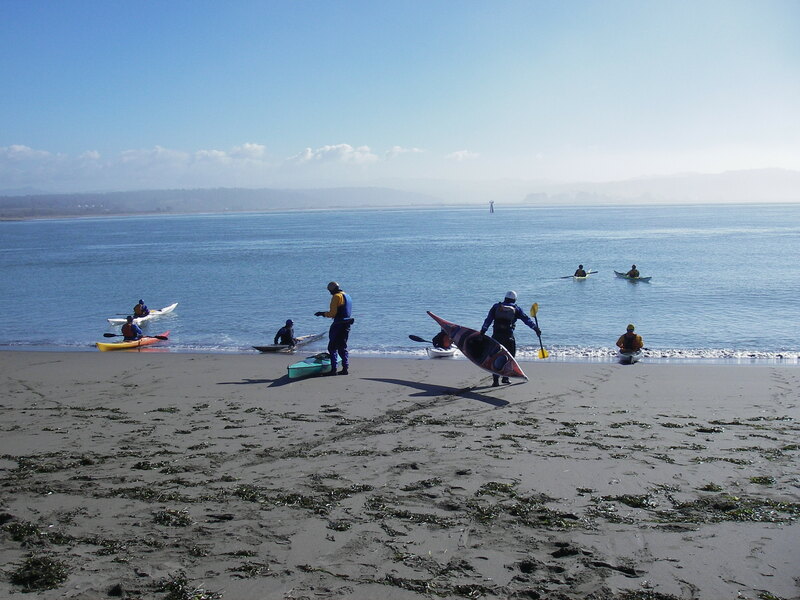 On the way back from a rough paddle down there, we bumped into a bunch of friends on the way past Baker Beach and back to Indian Beach. 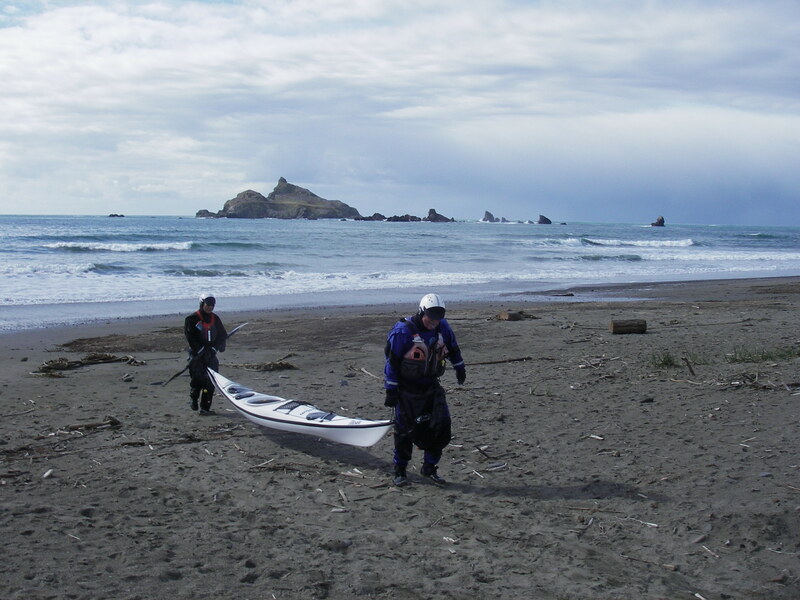 As usual we met at Wilson Creek in the morning to see if a launch there would be possible or adviseable; it was not so we proceeded north to Crescent City and gathered at Pebble Beach. Conditions looked perfect and the weather was fine. 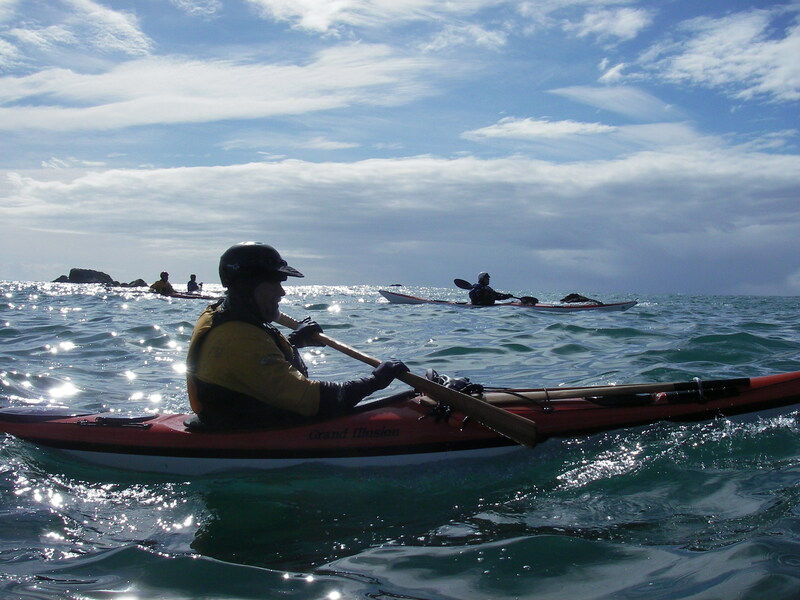 There were nine paddlers in the group so it was easy to keep everyone in contact. After a short talk on the beach about the day’s plan we launched through the small surf and proceeded out to circumnavigate Castle Rock and it’s adjoining reef just south of Point St. George. 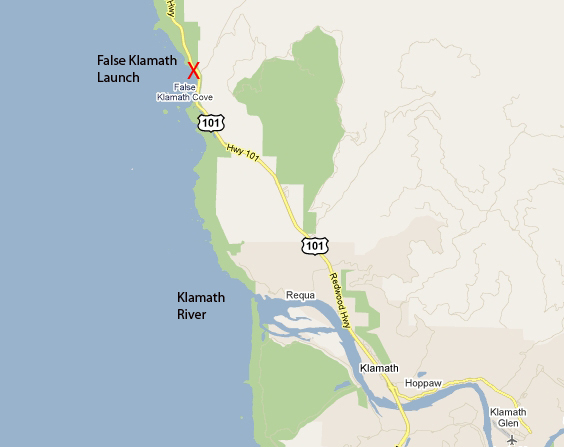 We circled the large island counter-clockwise. The northwest side was exposed to the swell and was pretty lively sending walls of water up the steep faces of the rock. 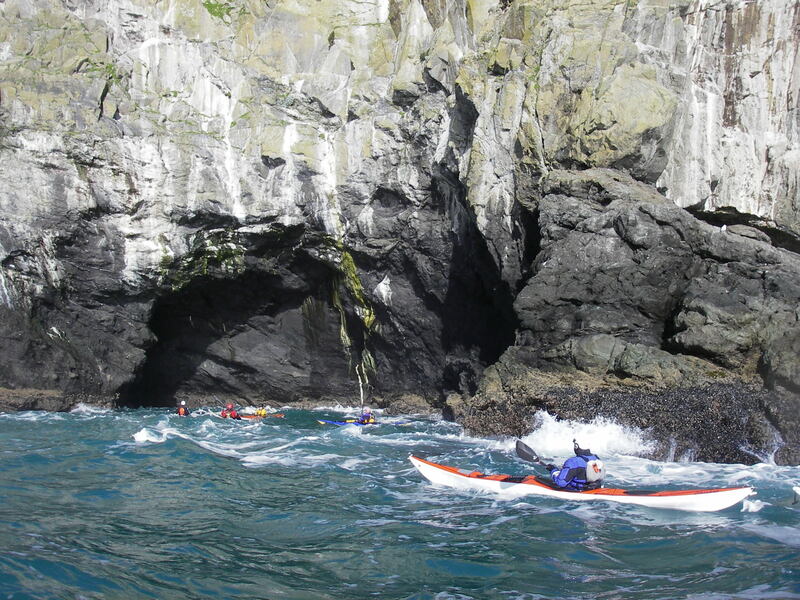 Continuing around, a few of us ventured through the short tunnel into the large cliff ringed cove on the south side of the rock. This early in the year the sea lions were few and not overly concerned with our presence. We made our way south basically rock to rock playing where we could. 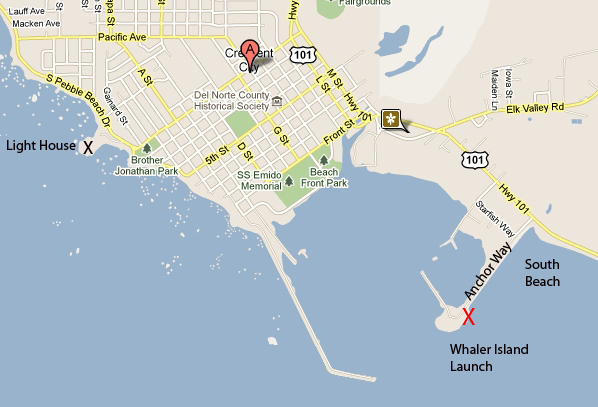 Our goal was to land on a beach somewhere near the Battery Point lighthouse for a break then return closer to shore. 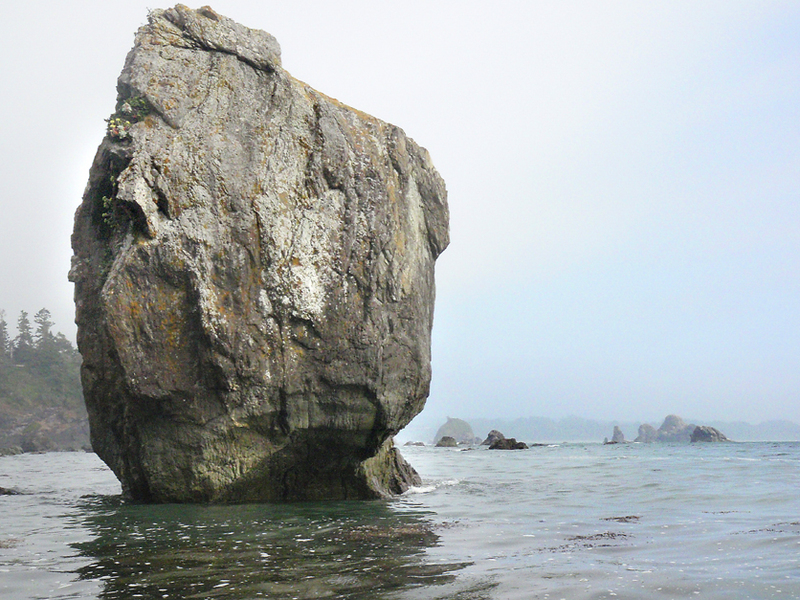 The off-shore rocks around Crescent City are an ideal playground as they are out in deep water and pretty safe to explore. Still, one has to be careful. 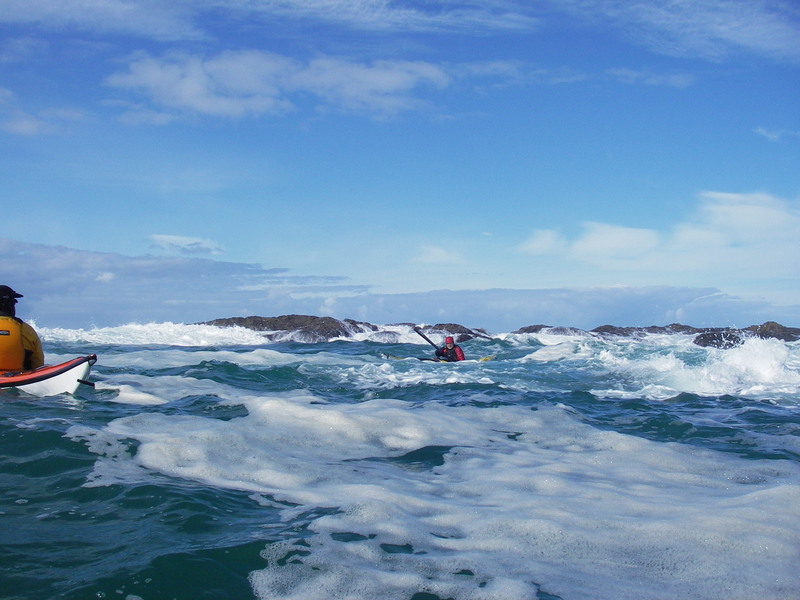 Mike Dedman decided to enter one lively passage between reefs and do a little roll practise. 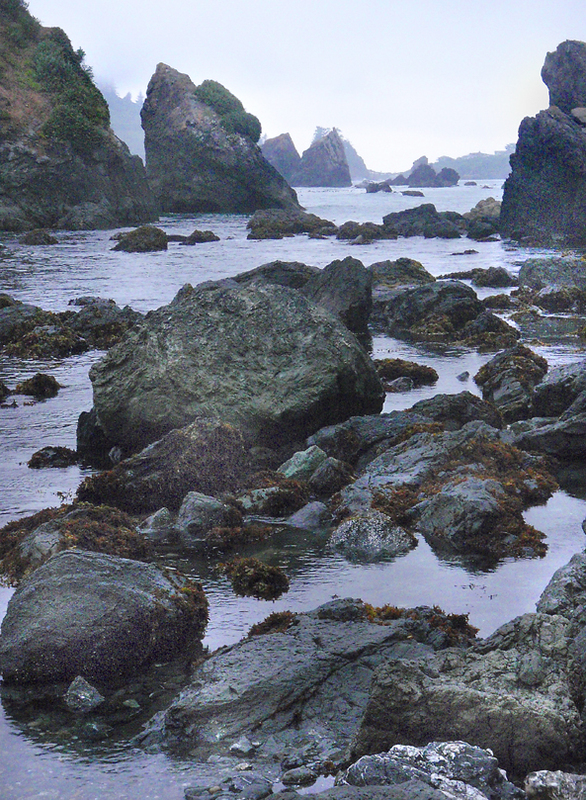 From there it was in to Battery Point to look for a soft landing among the rocks near the beach. It takes a little weaving and watching but it’s usually possible to find a guarded beach and a clean landing here in reasonable conditions. 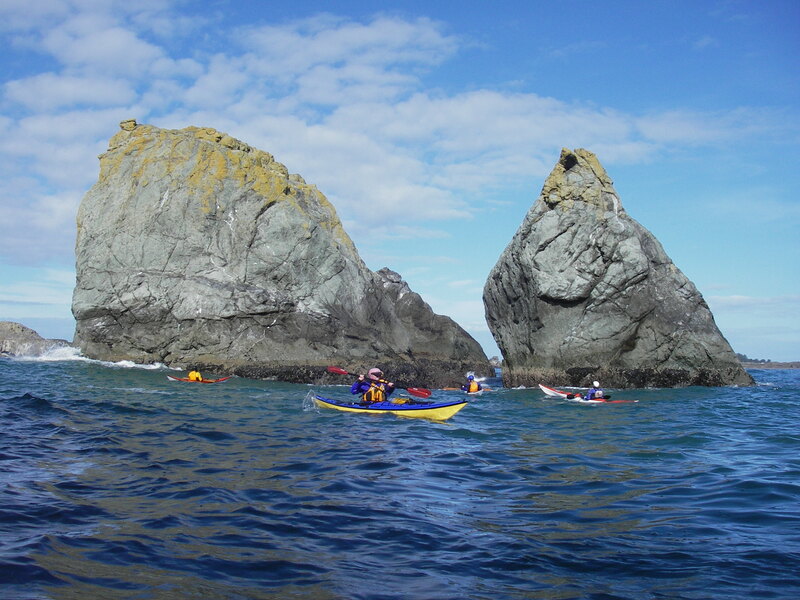 It was nice to stretch out in the sun here and have a drink, a bite, and a pee then back into the boats for a return to the put-in, this time hugging the coast a bit closer. 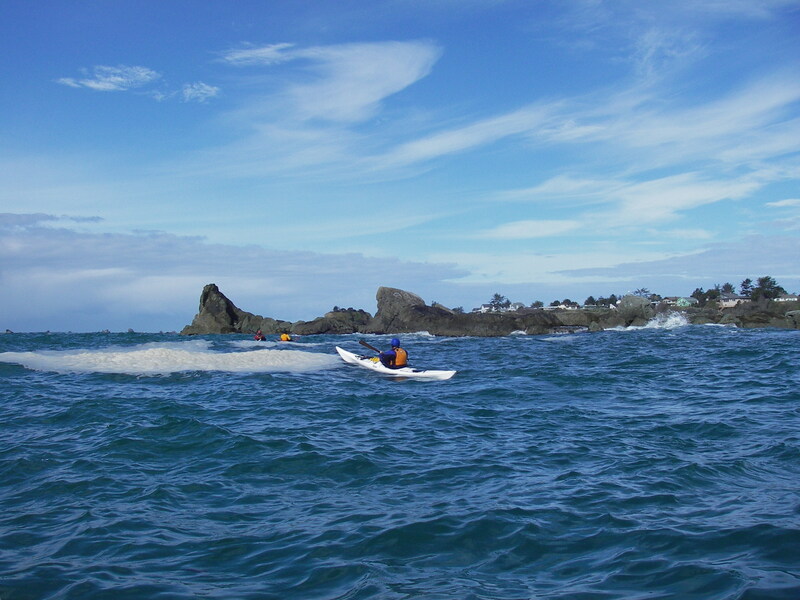 This area is still not completely familiar to us so we needed to keep an eye out for surprise breaks along the way but we had an enjoyable paddle back to Pebble Beach and then a nice surf landing to finish it. Dave showed off by pulling a couple of rolls in the soup in his new wooden boat. 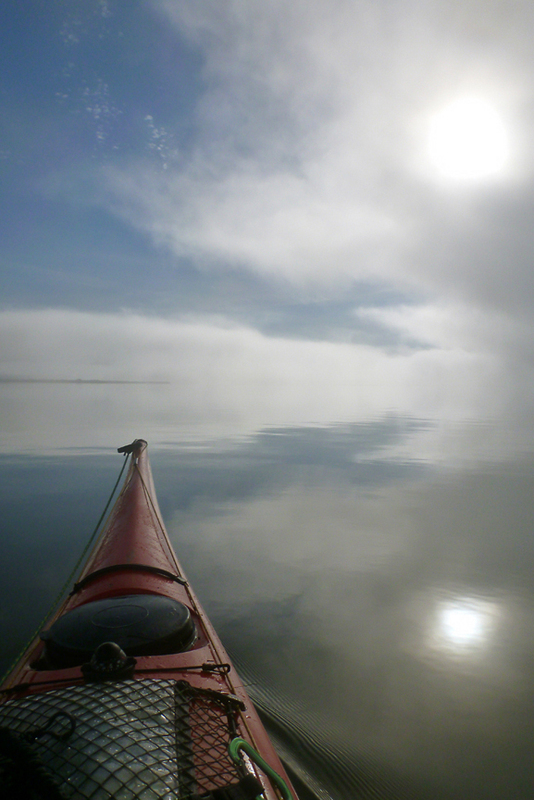 I’d like to thank the eight paddlers who joined me on this little adventure. 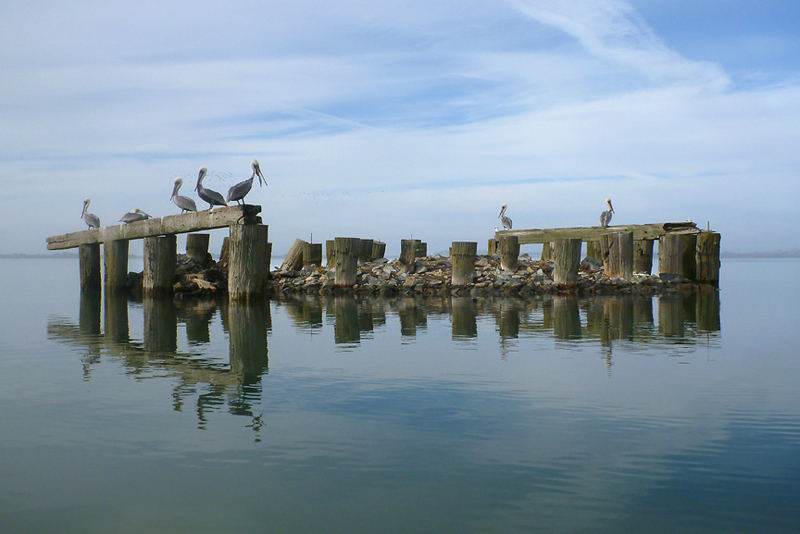 It was another marvelous day on the water in an area we don’t get to explore very often. More photos should be available on the club’s photo gallery. 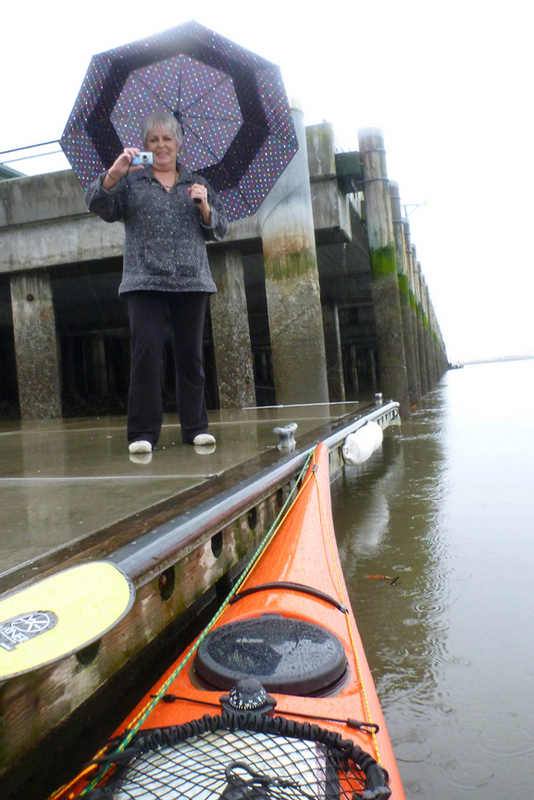 The plan for this paddle was to go play in the tide-rip that forms just west of the main channel by the Humboldt Bay Coast Guard Station. 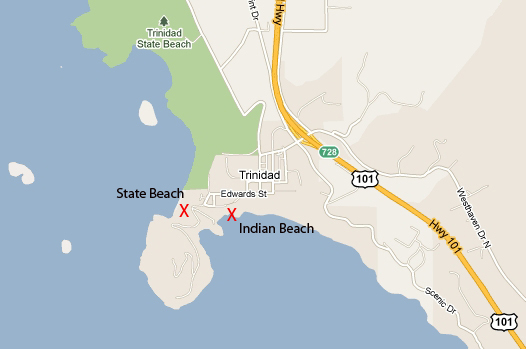 There are some sand-bars here that set up a nice surf break during certain tide and swell conditions. The tide situation was pretty good (though the exchange was a little bigger than ideal creating a strong current). Unfortunately a large swell had arrived, something like 15ft at 17sec, which would make the surf a bit too powerful for the introductory session I had in mind for this group. 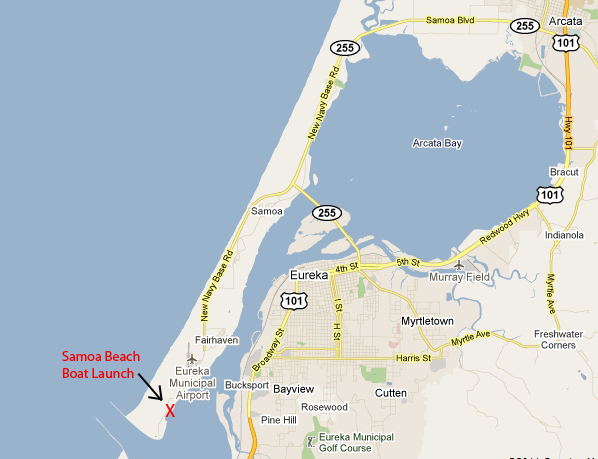 With a launch time of 1:00 we were all on the water by 1:10, pretty remarkable! 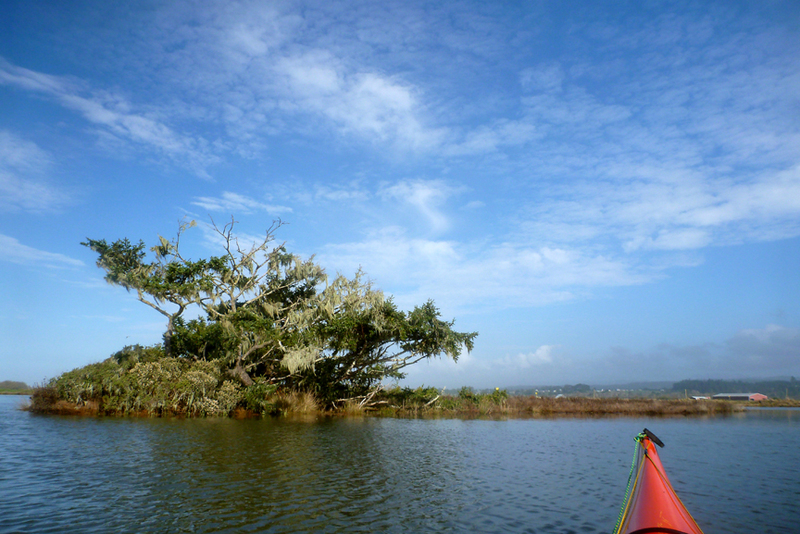 My co-leader, Helen, and I decided we would just paddle across and show people the break area and then do a nice paddle in Humboldt Bay. It was a glorious day, a continuation of our mid-winter stretch of summer weather. After a short talk on the beach about safety and technique we crossed the main shipping channel in a fairly tight pod practising our ferry-gliding skills to take us directly across channel to the play zone. 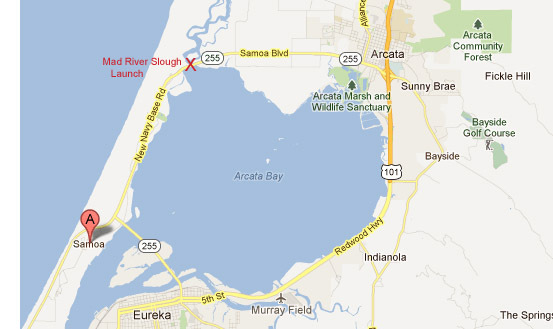 The sand-bars set up a series of breaks as the swells enter the mouth of the Bay and wrap around north. The northernmost break is the gentlest and that’s where we headed. I suggested everyone just hold position outside the rough water (one can get very close to the breaking waves and still maintain position in deep, safe water) while I entered the rip to demonstrate what things were like. When I turned around everyone had jumped right in and were playing around in the small surf with gusto. 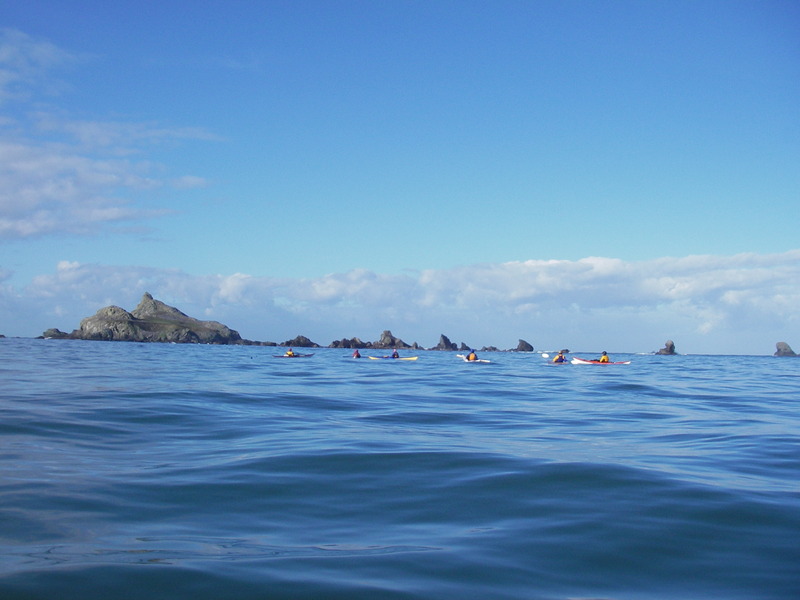 Conditions turned out to be just right here with small fairly gentle waves. 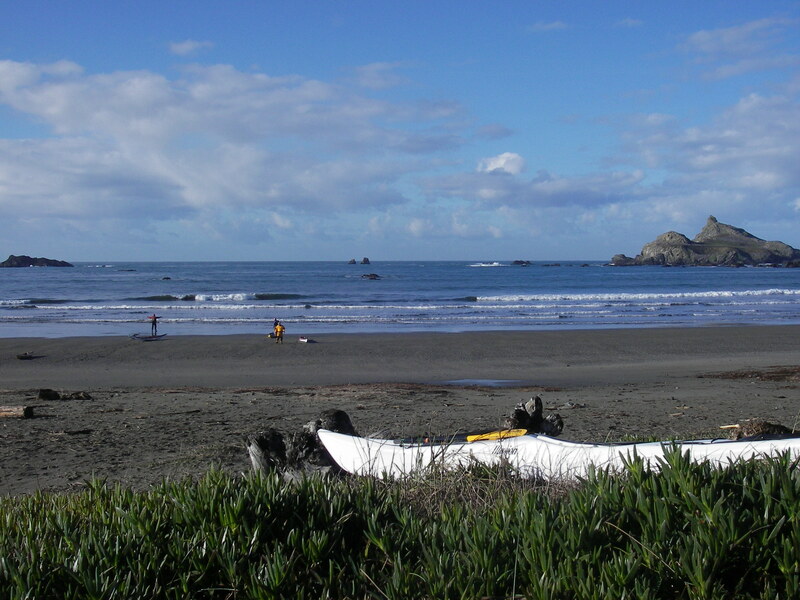 People were able to surf and practise bracing and side-surfing skills which is what this spot is perfect for. 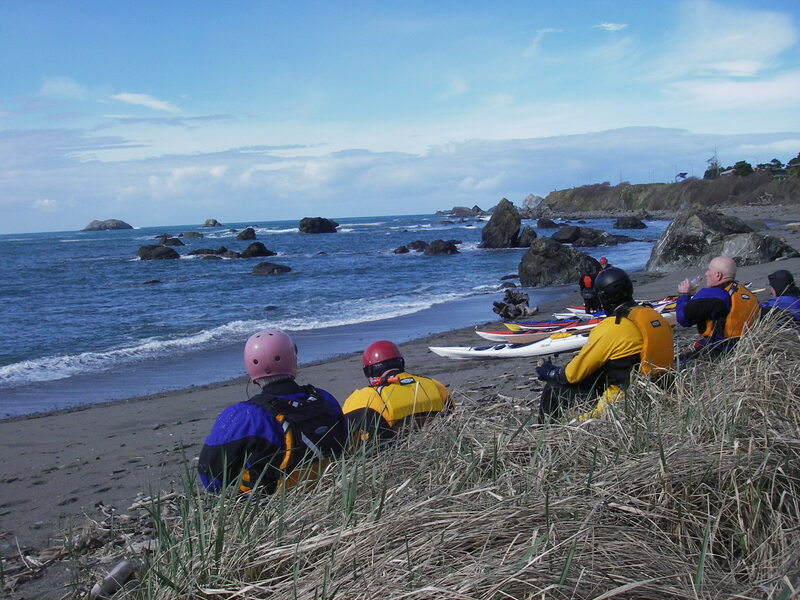 I witnessed a couple combat rolls and we did a few rescues and performed a tow to assist a paddler against the strong current. All of these were good experiences for everyone involved I think. After about 45min to an hour we’d begun to tire and the rip had changed significantly with the decreasing water depth. Some of the crowd took a breather on the beach on the far side of the channel then joined the rest of us heading back to the launch. Considering the swell conditions I had not expected to get people into the surf zone that day but everyone was very game and they all dove right in. People were having a good time and some were definitely pushing their skills and getting in some great practise. I was really impressed with folks. It was great to see a lot of new faces on this trip. 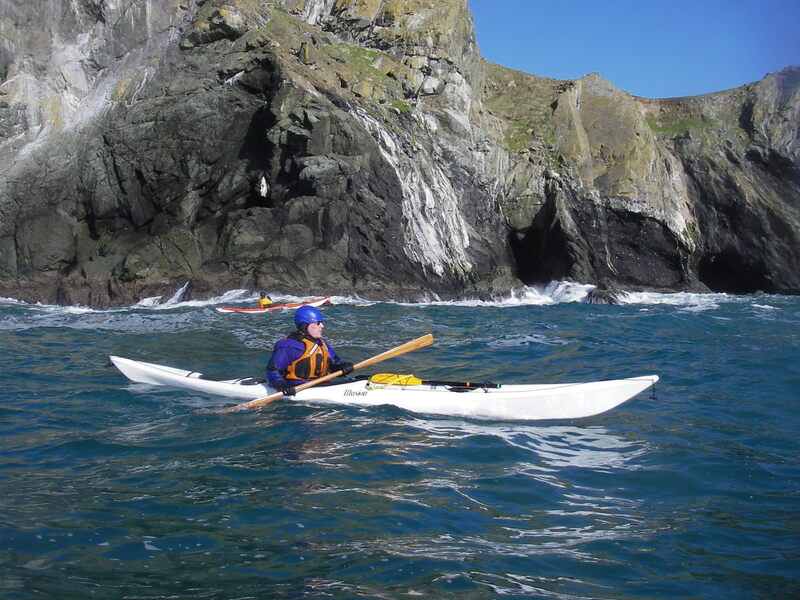 This is a great spot to play and work on boat handling skills as long as paddlers are aware of the dangers and have practised rescue skills and go as a group. There ought to be at least one tow-system included in the group kit in case someone needs assistance fighting the strong current that can set up. A VHF radio (and knowledge of how to use it) should also be carried; the Coast Guard is right there but won’t necessarily be watching to see if you’re in trouble. I had a great time leading this trip and introducing folks to this fun little play spot. I believe the club will be holding another trip or two out here this year so watch the calendar.